Family vacation, fun in the sun, delicious food, and indulging in water activities for all ages; what are we describing? Some of the benefits you could take advantage of when you join a boating club! If you’ve always wanted a boat, but don’t have the financial means for it, then joining a boating club might be the answer to your problems. Purchasing a boat is expensive, period. Who wants to spend tons of money on a boat you can only use a few months out of the year before you have to put it away for the season? You have to think about upkeep, maintenance, winterizing, boating insurance, storage, and that doesn’t even include the overall price of buying a boat. If you’ve always wanted a boat, but don’t want to put up with all of the other factors, then joining Freedom Boat Club is what you need to look into. You might already have preconceived notions about what joining a boating club will be like, which is what we wanted to address in our blog post along with all the benefits you could take advantage of when you join our boating club. A boating club, in your mind, might mean a few different things. You might think that boating clubs only caters to well off people, retirees, and middle aged families, but our boating club is so much more than that. We’re a family orientated boating club that welcomes all types of people, from all walks of life who all have one thing in common: a passion for boating. If you’ve never gone out boating, then joining a boating club is one of the best ways to indulge in a new hobby and try something new. 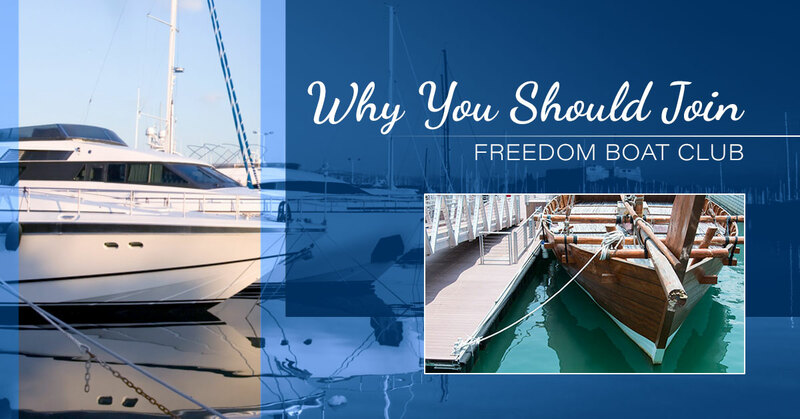 Below are a list of benefits you could experience when you join Freedom Boat Club. The first benefit is one of our favorites because many other boating clubs can’t say they have a bunch of boats to choose from. Are you one of those people who enjoys many different activities? Do you see yourself as an enigma? If so, then you’ll love our wide variety of boats to pick from. We offer pontoon boats and speed boats of all shapes and sizes. If you come visit us and are looking for a lazy day with your furry friend, some great people while out fishing, then a pontoon boat is the best option for you. If you want an energetic day out on Lake Lanier with a speed boat, then we have many different types. Some of our speed boats have cabins and are great overnight speed boats. Other speed boats we offer are great to take out for an entire day on Lake Lanier. Here is an extensive list of all of our boats that you can pick out to take out for the day or the entire weekend. When you belong to a boating club, you don’t have to worry about one of the many things that boat owners invest a lot of time and money into. Maintenance is a time consuming, tiresome, and important attribute you cannot ignore. Maintaining a boat is just like maintaining a car, but more expensive and more tiresome because you have to think about how to move it to the boat mechanics shop. When your car breaks you have to take it to a mechanic, the same with a boat. With a car, though maintenance can be very expensive, it’s far less than with a boat. If you are good with tools, then you can consider working on your boat yourself, however, if something goes wrong you’ll still have to take it to a boat mechanic. When you join a boating club, you don’t have to worry at all about boat maintenance. When you own a boat you have to worry about the upkeep of it. You have to worry about every single odd noise the boat makes or when it doesn’t start when it should. You have to worry about constantly keeping up with changing the oil, checking the propeller, and washing the boat to ensure it stays clean and sparkly. Why do you want to waste a beautiful Saturday or Sunday washing a boat when you could spend the day in the water on the boat enjoying your time spent as a family or with a group of friends? Instead of spending time and money upkeeping the boat, spend the time in the water enjoying a beautiful day on Lake Lanier. One of the many downfalls of owning a boat is winterizing it before winter sets in. Winterizing, unlike doing maintenance on a boat, is something you have to do yourself. Winterizing a boat is time consuming and not a great way to spend the last few remaining good days before winter hits. Winterizing a boat is when you make sure that your boat is ready for winter, which is something you wouldn’t have to worry about when you join Freedom Boat Club. Like when you own a car, you need to have boating insurance for when you take a boat out onto the water. Boating insurance is just as important as auto insurance because you never know what could happen on a boat in the water. Boating insurance, like car insurance, is expensive. Insurance will help overall if an emergency were to happen, but when you join a boating club you don’t have to worry about boat insurance. When you own a boat you need to worry about storage when it’s not in the water. Storage can be just as expensive as the many other attributes that cost you money when you own a boat. Storage for a boat is also a hindrance because you need to worry about getting your boat out of storage and getting it to the storage facility. If you don’t have a big car it can be a hassle moving a boat from point A to point B. There are many great restaurants about Freedom Boat Club. If you become a member with Freedom Boat Club, you are surrounded by some delicious places to stop by and eat. When you own a boat you’re spending so much money on insurance, storage, and everything else, it can be too expensive to eat out because you need to watch the pennies. When you join Freedom Boat Club, you’re able to have a little more leniency on where to eat because you aren’t spending as much money. Read An Option For Eating Part One, Part Two, Part Three, and Part Four, or check out Things To Do. Freedom Boat Club has great prices for memberships. When you add up how much you’d end up spending on a boat and add in all of the attributes that comes along with owning a boat, then you’ll realize how much you are actually saving when you join a boat club. When you join a boat club all you have to worry about is the membership. If you come out to Freedom Boat Club a few times a month, then you’ll realize how much you are able to save and the time you don’t have to spend maintaining a boat. Freedom Boat Club offers fun for the whole family. Boating is a great way to bond with your family and friends without the distraction of real life getting in the way. In addition, boating is a great way to de-stress from a long week and enjoy being outside. It can be hard to find time to spend with your family, but when you go boating at least once a week or once every two weeks you’re able to unplug and connect with the people who mean the most to you. When you join Freedom Boat Club you have access to all Freedom Boat Clubs in the country. If you find yourself in another state and wanting to go boating you have the access to do so anytime and anywhere. When you join a boating club you’re able to take advantage of all of the perks and have fun without having to worry about the upkeep, maintenance, winterizing, storage, and all of the other factors that go along with owning a boat.